… here’s my thought process – and I’d love your thoughts on this one! 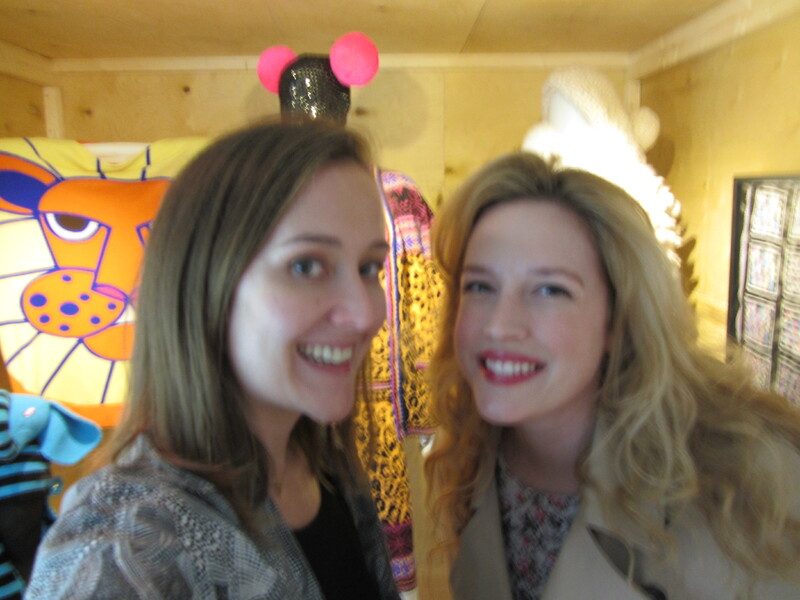 I dragged my friend and knitwear expert, Lauren, with me to Bermondsey in South London. I find that going to museums with someone who really knows their stuff is an added bonus – they inevitably pick up on things you would never have noticed! 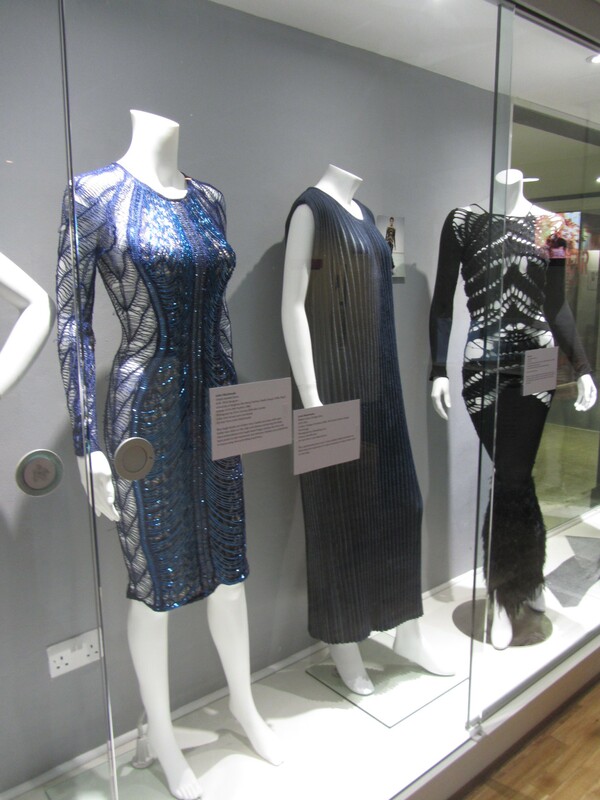 The gallery is relatively small, so I knew they could only fit a certain number of pieces – but they’ve really curated it beautifully, with a fabulous overview of inspirational, vintage and contemporary fashion knitwear from the 20th century. Everything was displayed in large wooden crates, scattered around the room and piled on top of each other. Each box contained its own little curated knit world! 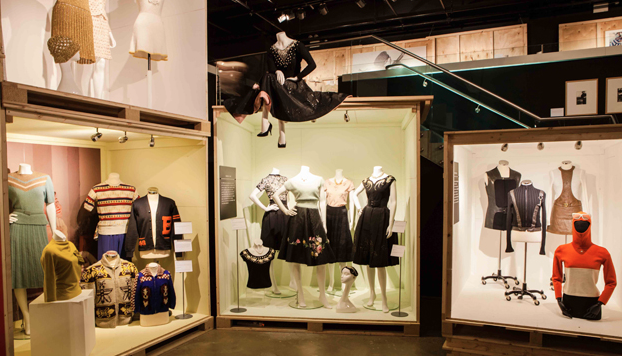 I was thrilled that the exhibit was laid out chronologically – so we were taken from 1920s Chanel jersey, into 1930s woollen swimwear, to 1970s Bill Gibb, right through to conceptual garments from 1980s and 1990s designers like Comme des Garçons and Vivienne Westwood and the more Strictly Come Dancing looks by Julien MacDonald, from the noughties! 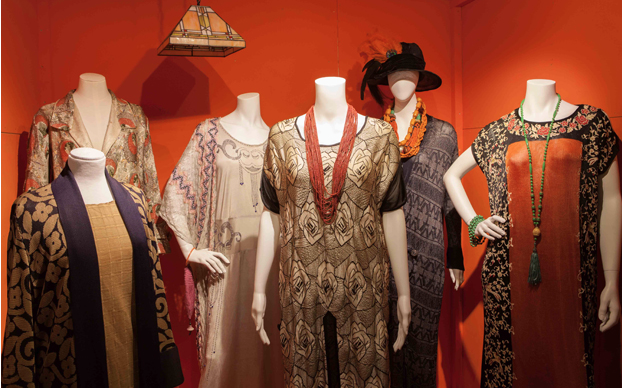 The early exhibits include knitted sportswear popularised during the First World War and easy-wearing Chanel twinsets from the 1920s. We were then introduced to the clothing restrictions and rations of the Second World War. 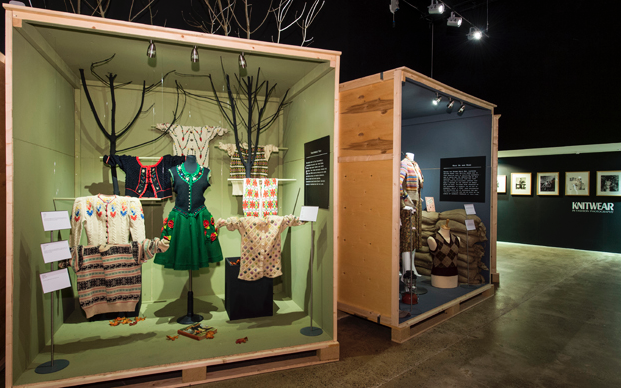 The displays showed how women became creative with old knitwear – a true testament to women’s creativity during that era: Sweaters were unravelled and the yarn recycled to make new multi-colour jumpers which made a feature of the variety of wools used. Sleeveless, side buttoned, heather grey knitted ensemble, US Vogue, February 1947 by Horst P. Horst © CORBIS; Coco Chanel in striped knitted jersey, Alex Stewart Sasha, 1929 © Hulton-Deutsch Collection/CORBIS. The transformation from functional to fashionable was complete by the 1950s, influenced largely by its popularity with Hollywood stars and leading avant garde designers. Examples of the ‘cocktail sweater’ feature a defined waist and embellishments at the neck and shoulders, while the crocheted mini-dress epitomises youth quake style in the 60s. I also rather liked the brightly coloured ‘novelty knit’ embellished with kitsch motifs; a hallmark of 1970s fashion. I nearly missed some of the wall art in the mezzanine gallery which featured photos from magazines such as Harper’s Bazaar, Vogue and Queen. Really beautiful and inspiring photographs from legends such as Norman Parkinson. 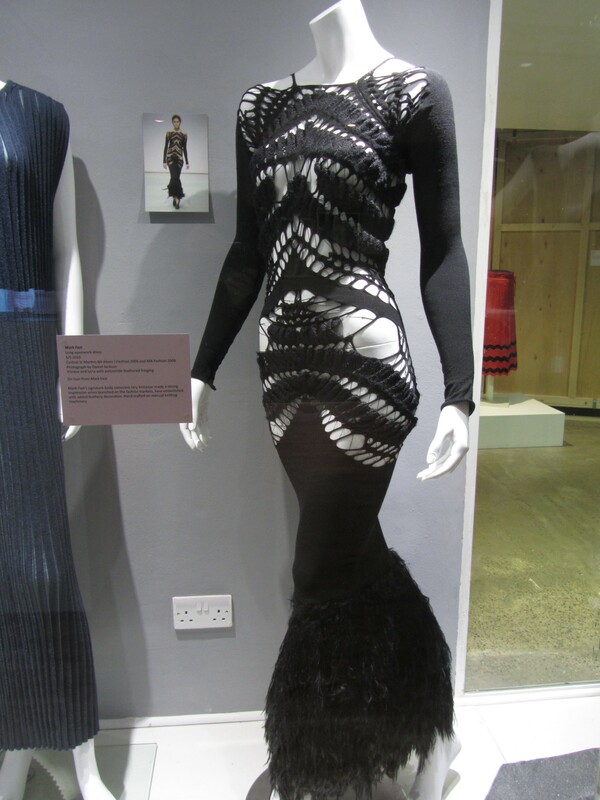 But I was most excited to see pieces from current knitwear designers like Sibling and Mark Fast – a personal favourite of mine – and from conceptual designers including Rei Kawakubo – being so close to one of his pieces in the flesh was a pure dream! 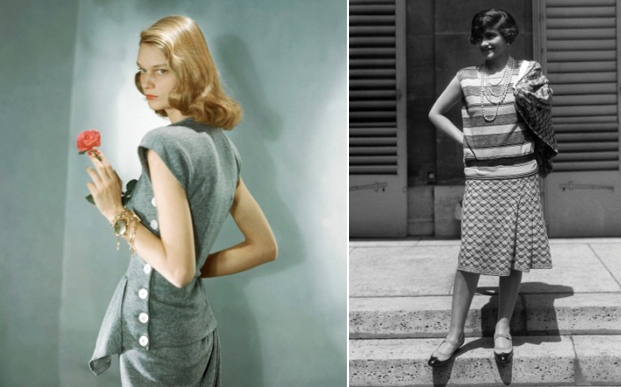 So why, then, is knitting so often seen as the poor relation of high fashion? 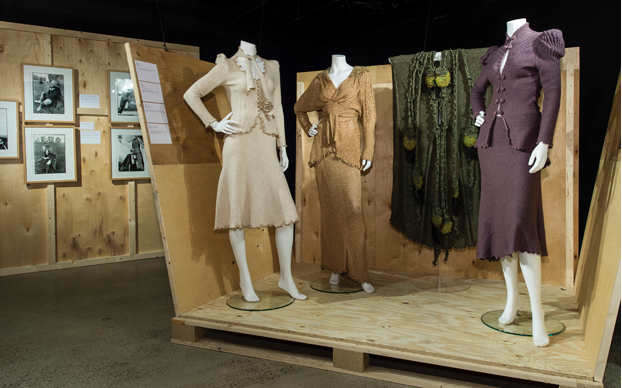 Dennis Nothdruft, the museum’s curator, believes the “basic functionality of knitwear” loses out against the glamour of couture. I’ve personally never viewed knitwear in that way. Of course there are unglamorous knit looks – but the same can be said of woven garments too. How anyone could look at the pieces from Mark Fast and Julien MacDonald (photos below), and say they lacked any glamour, is insane to me! If anything, the emotional and creative investment that goes into producing these pieces of knitwear is what gives the technique more value and couturier in my eyes. But coming from a fashion background, perhaps my understanding of manufacturing sways my judgement? Am I mad?? For me, a great designer can take any raw material, woven OR knitted, and turn it into something beautiful. Mark Fast – The technological intricacies of his work were truly astounding! 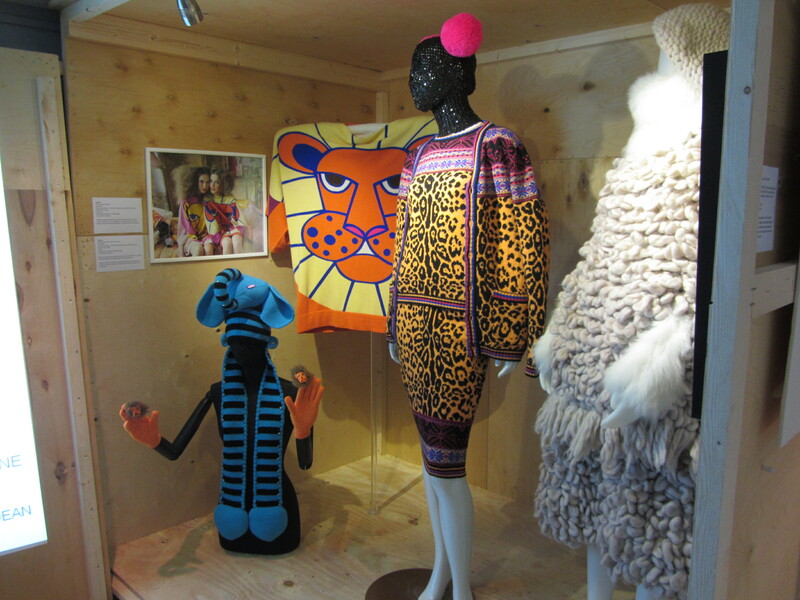 (From left to right) Yang Du (elephant scarf), Yang Du (tiger jumper), Sibling (leopard print) and Sibling (cream). The days when four-ply was stocked in every corner shop and you could have your chosen wool “put by” for collection are gone. Knitting wool is no longer the cheaper option…. Although there is hope: the museum’s Kaffe Fassett exhibition last year was hugely popular and proves that interest in the craft is far from extinct. I had never considered that knitwear was anywhere near being extinct. Perhaps it’s because I surround myself with creatives and am constantly met with beautiful interior and fashion knit pieces on Twitter that I don’t realise it’s happening in the outside world – am I missing something!? Granted, we are certainly lucky that the production of knitwear makes it much cheaper to purchase off-the-shelf knits, so there are less of us learning the skill. But to be extinct?! Perhaps it is becoming extinct and I hadn’t even noticed?! Getting back on track, the exhibition really is an exciting combination of famous names and visually interesting (sometimes astonishing) pieces. It’s an amazing documentation of the development of knitwear through fashion movements, such as Pop, Punk and Deconstruction and with new knitwear technologies and innovation. I would very much recommend it. Particularly as the days get a little darker and the rain becomes a little heavier it’s lovely to find something to do inside. There’s a small shop, for those inspired to pick up some knitting paraphernalia or early Christmas presents, and a café next door – which Lauren and I sampled and enjoyed! Tickets may be purchased in person on the day of the visit.